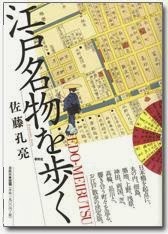 - Welcome to Edo 江戸 Yedo　!
. Four Guardians of the Compass .
. 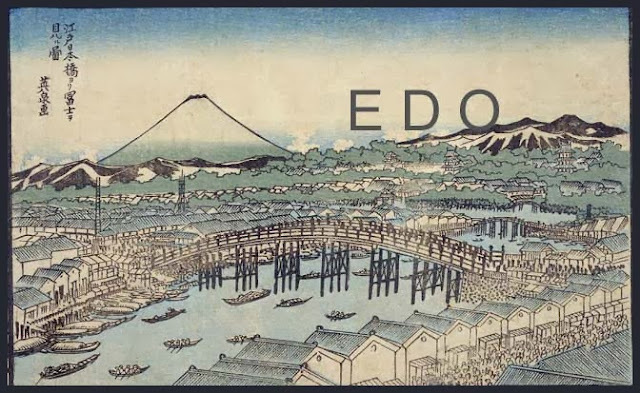 The History of Edo 江戸の歴史　- The Edo Period　江戸時代 .
. Tokaido 53 stations 東海道五十三次 .
. Edo Haikai 江戸俳諧　Haiku and Hokku - INFO .
. EDO - Persons, People .
. EDO - Specialities - Meibutsu .
. EDO - Shrines 神社 .
. EDO - Temples　お寺 .
. EDO - Places and Powerspots . - - - To join the Ukiyo-E friends, click the image ! Check the side bar on the top right for the CONTENTS! 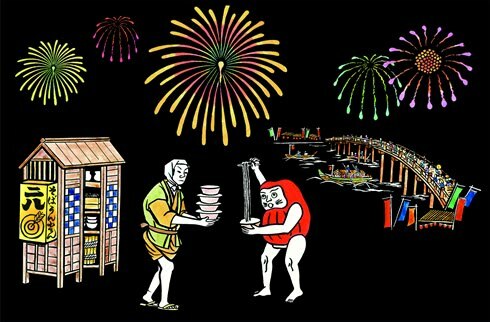 Fires and fighting were the "flowers of Edo", Edo no Hana.
. Edo Meibutsu 江戸名物　Specialities of Edo . From 1603 to 1868, the city of Edo was the seat of power of the Tokugawa shogunate and the political center of Japan. 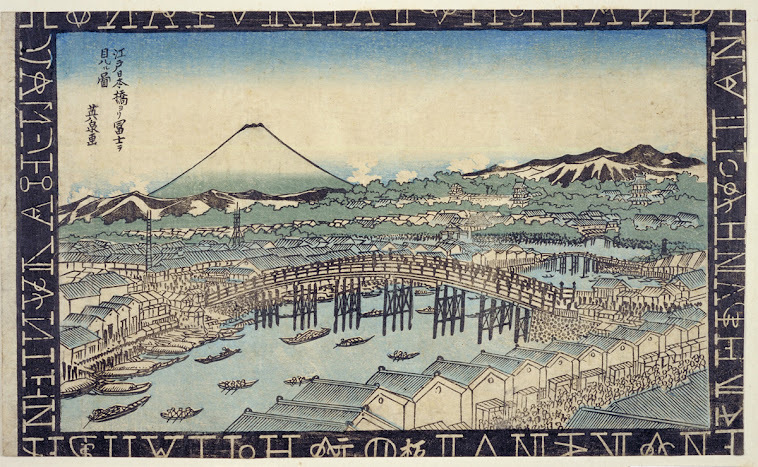 In 1868 the city was renamed Tokyo and made the official capital of the nation. Both literally and figuratively, present-day Tokyo rests upon the foundations of Edo, and much of what is now thought of as traditional Japanese culture (woodblock prints, kabuki, sumo, haiku poetry) found its final form in Edo. In this book, through over 200 black and white drawings and an insightful text, old Edo is brought vividly to life—its planning, its construction, and the cultural energy that made it one of the most exciting, and populous, cities on the face of the earth. 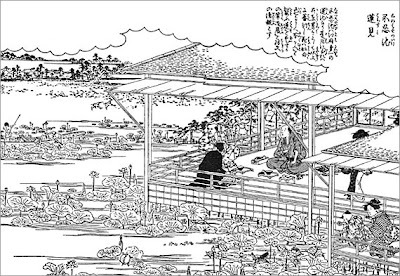 Edo was nothing more than a village on the edge of Edo Bay when Ieyasu Tokugawa chose it as the site for a castle from which he, as shogun, could administer the country. The castle was of utmost importance because Japan had just emerged from a hundred years of civil war, and Ieyasu was determined that the power he had gained should not be wrested from him by antagonistic warlords. 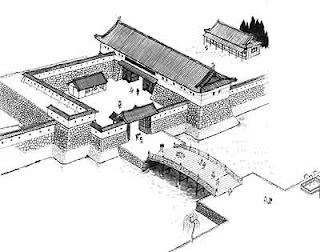 The castle, of course, had to be supplied with the necessities of everyday life, and thus a town had to be built where merchants and artisans could live. 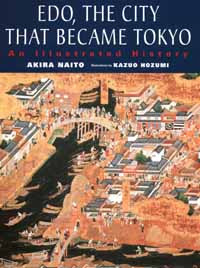 It is the planning and construction of Edo Castle and the town that would support it that lie at the core of this book. In fact, the construction of the city would be an ongoing process throughout its –year history, in the wake of repeated devastation by fire and earthquake and under the pressure of an ever-expanding population. 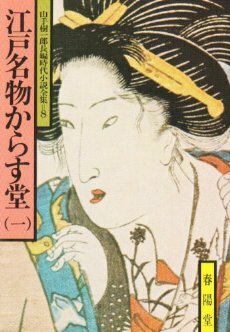 Another aspect of the book concerns Edo's cultural life, which moved over time from classical conventions dominated by the samurai to the more popular and lively forms favored by the merchants and artisans. 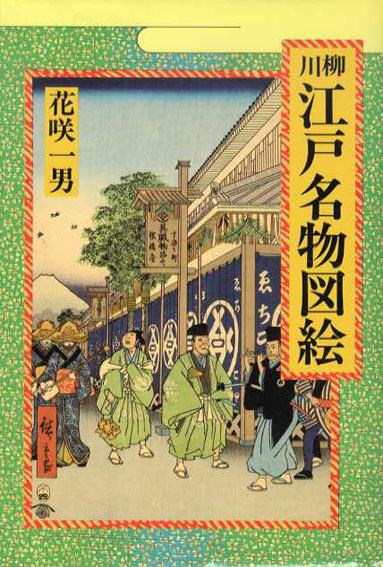 Featured here are temples and shrines, festivals, bath houses, pleasure quarters, kabuki theaters, street gangs, the poet Basho, sumo wrestling, side shows, ukiyo-e prints, barbers, and much more. and I live in the city of Edo (you probably call my city "Tokyo" -- that's the modern name for Edo). I'd like to take you on a trip through my city, to see what it was like when it was still ruled by the Shogun, when samurai walked the streets, accompanied by beautiful women wearing silk kimono. There are lots of sights to see and plenty to learn about ancient Japan. But first, you have to travel back in time about 200 years.
. Tookyoo jusha 東京十社 ten shrines of Tokyo - Edo .
. BOOK - Titles of Books, Articles etc. - Book, Buchtitel .
. Hana no Miyako 花の都 - Kyoto, the old capital . 2　From the 13c-19c, a building in upper class residences, used to prepare and cook food. Typically, it included an earth-floored area *doma 土間, equipped with a cooking range *kamado 竈, and sometimes a well *ido 井戸, and sink *nagashi 流し. 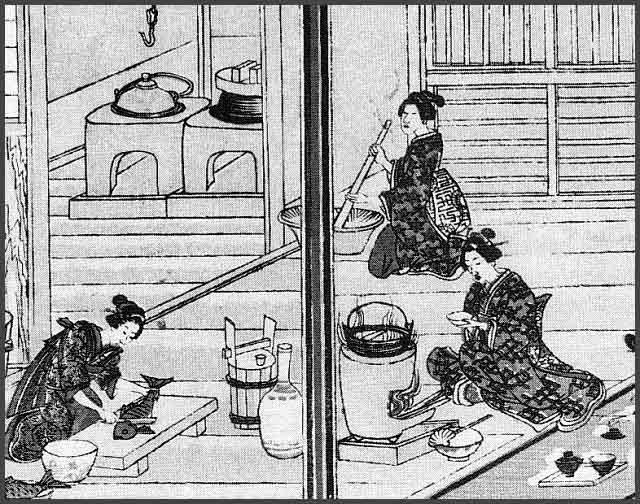 In addition it incorporated a suite of raised floor rooms, some of which were equipped with an open hearth *irori 囲炉裏, where more advanced stages of food preparation and serving took place. There was generally a smoke louvre *kemuridashi 煙出, in the roof. The building also contained storage space for food and utensils, and particularly in the medieval period, it is believed to have included accommodation for servants and lower members of the household. 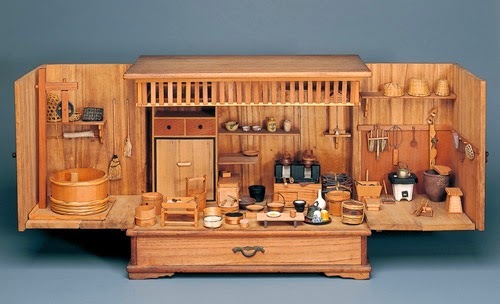 In large residences, such as the baronial mansions, daimyou yashiki 大名屋敷, of the Edo period, the main kitchen was often divided into two: a lower kitchen *shimodaidokoro 下台所, and an upper kitchen *kamidaidokoro 上台所. Alternative medieval terms for the upper class daidokoro include *mizushidokoro 御厨子所, zendokoro 膳所, and zenbu 膳部. 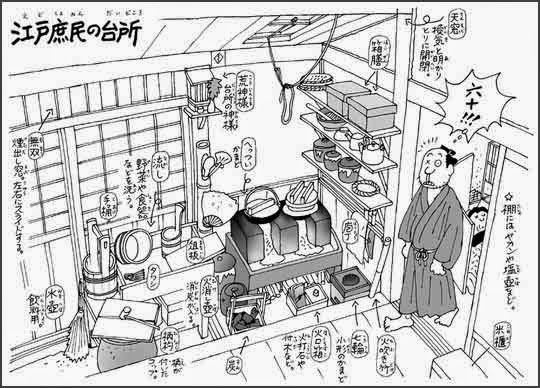 In the Edo period the upper kitchen might alternatively be referred to as *kiyodokoro 清所 or *ryouri-no-ma 料理の間, and the lower kitchen as oodaidokoro 大台所. 6　In urban vernacular houses *machiya 町家 of the Edo period, especially in the Kyoto area and regions influenced by it, a room to the rear of the shop *mise 店, adjacent to the earth-floored area doma, used for dining and the preparation of food and as a family parlor. It was also often referred to as the naka-no-ma 中の間. In all regions, daidokoro was often abbreviated to daidoko 台どこ and in certain areas to dedoko でどこ. Daidokoro is sometimes written 大所. 長屋　ながや long house, row housing . 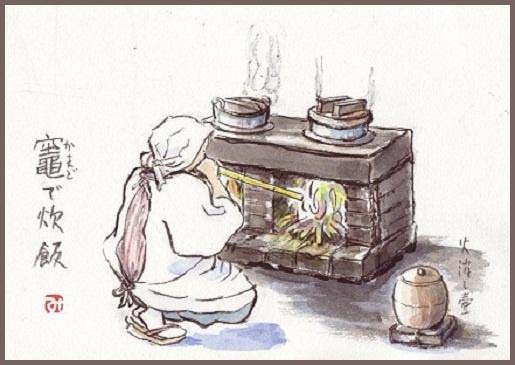 hetsui, 竈(へ)つ火 "stove with fire", also the name for the Deity.
. ido 井戸 well - and kigo .
. irori　囲炉裏　/ いろり　open sunken hearth .
. kamado 竈 cooking stove - Haiku introduction .
. Kamagami 釜神 The Hearth Deity . mizushi 水仕, mizushigoto, mizu shigoto 水仕事 washing the dishes, doing "water work"
. nabe なべ　鍋 pot and pan . oodaidokoro 大台所 lower kitchen, lit. "big kitchen"
. zen 膳 food tray for one person . CLICK for more photos of the Edo kitchen! a special one for use only on festive occasions and for preparing rice cakes. The symbolic significance of the kamado was in proportion to its functional importance as a cooking appliance and adjunct of the hearth. Its tutelary spirit, kamadogami, was one of the principal household deities, revered as provider of the means to cook and feared as a potential cause of conflagration. For fear of fire, many homes in a Nagaya living quarter in Edo did not have a stove. Some kitchens did not even have a knife. The vegetables were torn by hand, the Tofu was deliverd as it was eaten and the fish came cut by the fish vendor. The hearth-making craftsmen were a group in itself with special skills according to the type of hearth to be made. Homes in Kyoto usually had three "mouths" 三つ口, some even nine 九つ口. 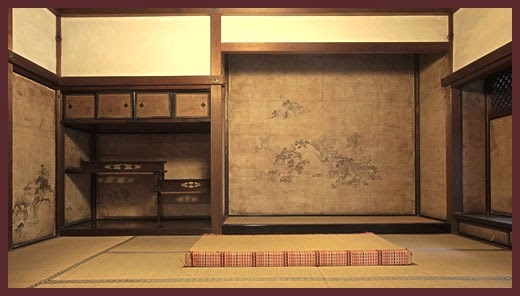 The hetsui hearth of Edo was built with the back to the doma 土間 entrance hall, so the wife could see the living room. 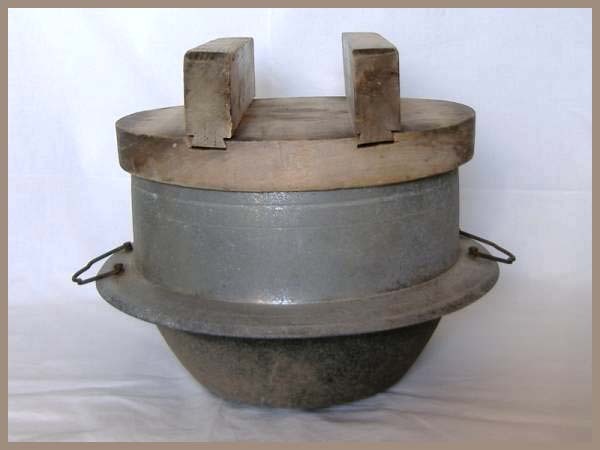 Most hearths were coverd with a black coating. The kamado (also called hettsui へっつい in Edo) was used every day to prepare the meals. Usually it had two openings to fire up separately. To put new plaster earth around the hearth as a fire protection was usually done as one of the preparations for the New Year. Craftsmen who made these wooden lids made also many other wooden tools for a home and kitchen, for example the wooden cutting boards. The lids had to fit well to make sure no steam was coming out of the pot. The wood was about 3 cm thick.
. kamabuta tsuitachi 釜蓋朔日 opening the chauldron on the first day . On the first day of the seventh lunar month (now August 1) the chauldron of hell was opened to let the souls out for their visit to the family graves. From this day on, the Urabon ceremonies were started. Kamafuta Jinja 釜蓋神社 "Kamafuta Shrine"
The deity of this shrine has long been venerated by the Samurai. To pray for victory before a battle, they came here with an old lid or kettle and offered it with the wish that bullets from the enemy gun would not hit them. So ever more Samurai visited here. Now people also pray for good luck and luck with a new business, even victory in sports. They put a lid on their head and walk from the entrance Torii gate of the Shrine building. If the lid does not fall down, their wish will be granted . . .
. Washoku 和食歳時記 Japanese Food Culture .
. kigo related to the kitchen .
. bongama 盆竈 Bon stove .
. kamabarai 竈祓 (かまばらい) hearth purification . . . 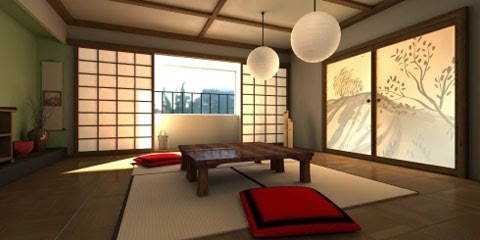 Interior Design - The Japanese Home . .
. tokonoma 床の間 alcove for decorations . One of the three most famous chigaidana 天下の三棚.
. . . the design of the shelves resembles mist floating. 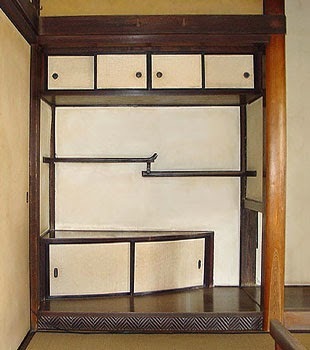 Staggered shelves; considered part of the *shoin 書院 style decoration. 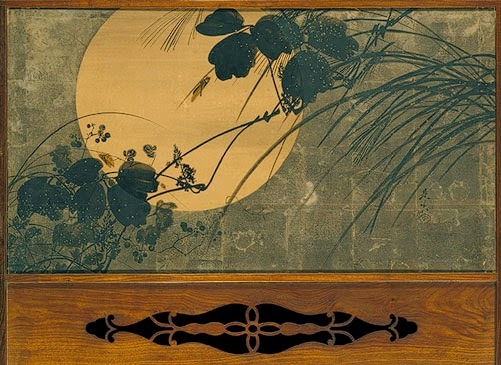 One of the room ornaments which became established together with the decorative alcove *tokonoma 床の間 and attached desk *oshi-ita 押板 at the end of the Muromachi period, in the formal reception room *zashiki 座敷. Usually located at the side of the decorative alcove. Two shelf boards are fixed at different levels, a small pillar *ebizuka 海老束 is inserted between them, and small edge-strips *fudegaeshi 筆返し, are attached at the edge of the top shelf. A doored shelf is provided at the top or below the shelf boards, or both. Upper doored shelves are called tenbukuro 天袋 (see *fukurodana 袋棚) and lower ones *jibukuro 地袋. Shelves in dwellings were originally practical, used to store personal belongings close at hand. 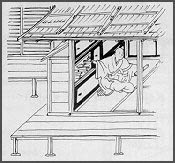 In the Muromachi period, ornamental shelves began to be developed at Ashikaga Yoshimasa's 足利義政 (1436-90) mansions, Ogawagosho 小川御所 and Higashiyamadono 東山殿. 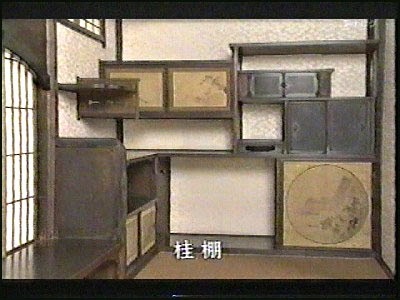 The Muromachi period text OKAZARIKI 御飾記, describes room ornaments in those two mansions, with drawings of shelves together with oshi-ita, and descriptions of the methods of making shelves and ways of decorating. The chigaidana in the meeting room of Higashigoten 東御殿, Ogawagosho, for example, was constructed at right angles to the oshi-ita, one bay wide (just under 2m), with upper and lower doored shelves, and there were two layers of staggered shelves (an arrangement called *shikiri chigaidana 仕切違い棚). On the top shelf was an incense burner, a tea container on a small tray, a small bowl on a tray, and on the bottom shelf were implements associated with the presentation of kaiseki 懐石 food (refined Kyoto cuisine). 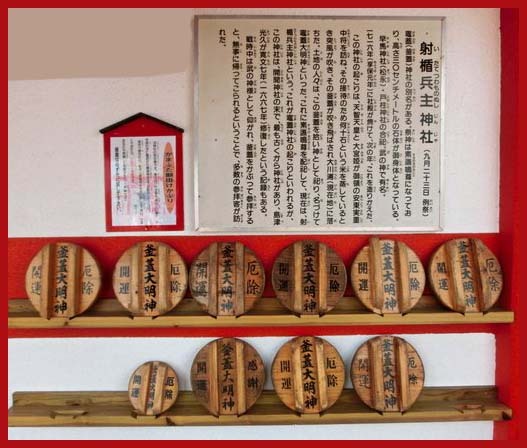 These were typical of items displayed on chigaidana, which also included inkstone *suzuri 硯 boxes and writing paper, books, and tea ceremony implements like teabowls *chawan 茶碗, and bamboo tea whisks. Around this time many art objects were imported from China, so chigaidana had an important function in displaying these. The oldest extant example of chigaidana can be seen in *Tougudou 東求堂 (Togu-Do) at Jishouji 慈照寺 (jisho-Ji) (1485), Kyoto. 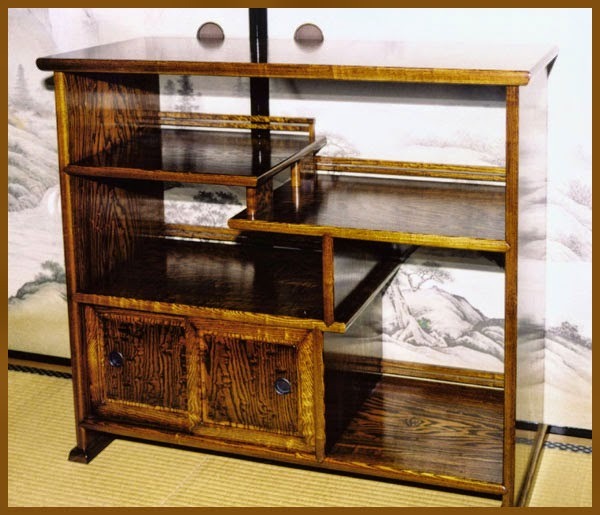 The chigaidana, half a bay wide, is built alongside the attached desk in a 4 1/2 mat room called Douninsai 同仁斎 (Doninsai). This set of shelves has a bottom board ji-ita 地板 with a jibukuro on top of it, a staggered shelf in the middle and one shelf board on top. 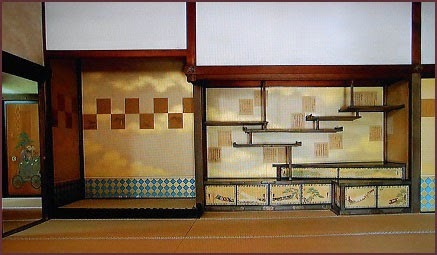 After the Momoyama period, shelves were usually constructed alongside the alcove, and there were many variations in the shape of the shelf boards. Tenbukuro and jibukuro were sometimes included. Shelves at Katsura Rikyuu 桂離宮 (17c), and Shugakuin Rikyuu 修学院離宮 (1659), both in Kyoto, for example, have complicated structures and are constructed with great technical skill. Also written 蝦束; also hinazuka 雛束. A small strut with chamfered corners used between two staggered shelves *chigaidana 違い棚. The two ends of the strut are cut into dovetail tenons *arihozo 蟻ほぞ and inserted into mortises arihozoana 蟻ほぞ穴 cut into the underside of the upper shelf and the top side of the lower shelf. The width of the strut is about equal to 4/10 the width of the alcove post. A curved wooden border attached to the end of a desk or shelf to prevent brushes and scrolls from rolling off. It is also decorative and is found on staggered shelves *chigaidana 違い棚, short writing desks fuzukue 文机 and sutra stands kyoudai 経台. The tip of the fudegaeshi is called tomari とまり, the main body is called fudegaeshi, the lower convex curve is called hatomune 鳩胸 (pigeon breast). 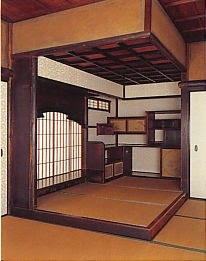 The width of the table or shelf extending beyond the attached border is known as ita-no-de 板の出. Various types of fudegaeshi are distinguished by the shape of their cross-section. 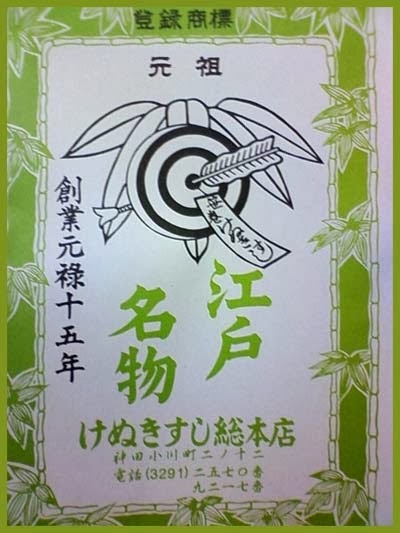 These include: tatsunami 立波 (standing wave); wakaba 若葉 (young leaf); miyakodori 都鳥 (seagull); karaba 唐葉 (Chinese leaf); kaeshinami 返波 (returning wave), and takagashira 鷹頭 (hawks head). It is believed that the chigai-dana (or staggered shelves) evolved from earlier portable shelving systems. This theory is backed up by the continued use of portable-type shelves throughout the Muromachi period outside of the central room. It was in Yoshimasa's time that built-in shelves first appeared. Furthermore, evidence shows that these were installed in both Yoshimasa's Kokawa palace and his Higashiyama residence. To the left is the Picture Scoll of Kasuga Gongen Miracles from the 14th Century showing the artistic evidence of the built-shelves. The main purpose of the chigai-dana of this time was to provide a place for the artistic arrangement of books and tea utensils. The function of holding books was a direct influence of Zen monks. During this time there was extensive trade with China and Korea, which resulted in an enormous influx of literary and philosophical texts. Only after these imported texts were tea utensils displayed on these shelves. Typically this included a tea cup, tea caddy, tea whisk, food canister, tea ladle, portable fireplace, feather broom, ember poker, and water bowl.
. WKD : nagaki hi 永き日, hi nagashi　日永し day getting longer .
. shika naku 鹿鳴く（しかなく) deer is calling . The most common terms for aesthetics and design are introduced here. Japanese interior design has a unique aesthetic derived from Taoism, Zen Buddhism, specific religious figures and the west. This aesthetic has in turn influenced western style, particularly Modernism. Interiors are very simple, highlighting minimal and natural decoration. Traditional Japanese interiors, as well as modern, incorporate mainly natural materials including fine woods, bamboo, silk, rice straw mats, and paper shōji screens. Natural materials are used to keep simplicity in the space that connects to nature. Natural color schemes are used and neutral palettes including black, white, off-white, gray, and brown. Japanese interior design is very efficient in the use of resources. Traditional and modern Japanese interiors have been flexible in use and designed mostly with natural materials. The spaces are used as multifunctional rooms. The rooms can be opened to create more space for a particular occasion or for more privacy, or vice versa closed-off by pulling closed paper screens called shōji. A recessed space called tokonoma is often present in traditional as well as modern Japanese living rooms. This is the focus of the room and displays Japanese art, usually a painting or calligraphy.
. butsuma 仏間 room for the Buddhist house altar .
. chanoma 茶の間 private living room "tea room" . chuunikai, chuu nikai 中二階 mezzanine "middle second floor"
daikokubashira 大黒柱 main support pillar of a wooden home "Daikoku-pillar"
. furo 風呂, basuruumu バスルーム bathroom .
. fusuma 襖 and shoji 障子 sliding door .
. fuyuzashiki, fuyu-zashiki 冬座敷 Japanese living room in winter . - - - - - hashigodan 梯子段 (a flight of) stairs "like a ladder"
. kagu 家具 furniture // wa kagu 和家具　Japanese furniture .
. kawaya 厠, setchin 雪隠, habakari 憚り, benjo 便所 toilet .
. kugikakushi, kugi kakushi 釘隠し "hiding the nails" nail-hiding ornament .
. kugi 釘 nail, Nagel - Introduction .
. mado 窓 window .
. menkawabashira 面皮柱 Menkawa pillar or post .
. natsuzashiki, natsu-zashiki夏座敷 living room in summer . nihonma, Nihon-ma 日本間 "Japanese room"
. 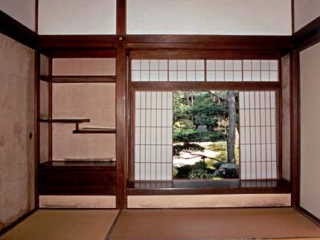 okuzashiki 奥座敷 living room in the back .
. ranma 欄間 transom, open panel carvings .
. tatami 畳 floor mats . tenmado 天窓 rooflight, "window to see heaven"
. tokonoma 床の間 alcove for decorations, art nook .
. tooriniwa - inour facebook gallery .
. uguisubari うぐいす張 / 鴬張 / 鶯張り nightingale floor .
. zabuton 座布団 sitting cushion .
. zashiki 座敷 guest room, drawing room, sitting room . 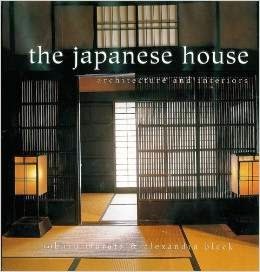 The simple beauty of Japanese architecture and design has inspired many of the world's top architects and designers-Bruno Taut, Frank Lloyd Wright, and Terence Conran, to name just a few. The grace and elegance of the Japanese sensibility is reflected in both modern and traditional Japanese homes, from their fluid floor plans to their use of natural materials. In The Japanese House, renowned Japanese photographer Noboru Murata has captured this Eastern spirit with hundreds of vivid color photographs of 15 Japanese homes. As we step behind the lens with Murata, we're witness to the unique Japanese aesthetic-to the simple proportions modeled after the square of the tatami mat; to refined, rustic decor; to earthy materials like wood, paper, straw, ceramics, and textiles. This is a glorious house-tour readers can return to again and again-for ideas, inspiration, or simply admiration. So rich and unique is traditional Japanese architecture that it’s hard to improve upon. Yet contemporary Japanese designers and architects keep finding new ways to refurbish and take inspiration from the ways of old. Whether it’s a pristinely preserved traditional house or a cutting-edge apartment, the best Japanese homes share a love of cleverly designed spaces and warm materials such as wood, bricks, and bamboo. 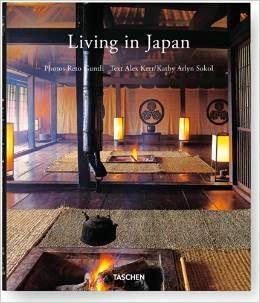 From a thatched roof farmhouse occupied by a Zen priest to Tadao Ando’s experimental 4x4 House, Shigeru Ban’s conceptual Shutter House, and a beautiful homage to bamboo in the form of a home, this book traverses the multifaceted landscape of Japanese living today. 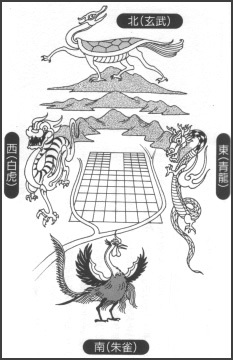 Also included is a list of addresses and a glossary of terms, such as tatami. Basically, there are thousands great ideas about home interior design that will inspire you in deciding the right home interior design, western interior design, European home interior design or maybe Asian home interior design. Asian interior design is one of great ideas; one of Asian home interior design which maybe can be great inspiration for you is Modern Japanese interior design. Special characteristic from Modern Japanese interior design is the minimalist design; commonly Japanese homes are small home that is occupied by one family. The other Japanese home character is, commonly Japanese home involve hallway, and the hallway is located between one room and the other. The hallway is used to connect the rooms of the home. Common modern Japanese home interior design provides an outdoor terrace inside home; this way is done to give fresh air for home. Modern Japanese interior design is inspired from Traditional Japanese home.